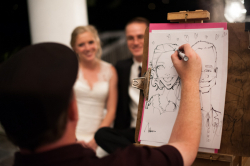 Do you enjoy a Custom Caricature Likeness of You, Your Family, Your Colleagues? Charlotte Party Rentals Caricature Artists are here for all Occasion – Weddings, Rehearsal Dinners, Save the Date, Anniversaries, Birthdays, Sweet 16’s, Confirmations, Bar/Bat Mitzvahs, Family Reunions, Block Parties, Business Events. This is sure a great take away for you and your guests. One Caricature Artist, supplies provided including a Table & Chair Setup.